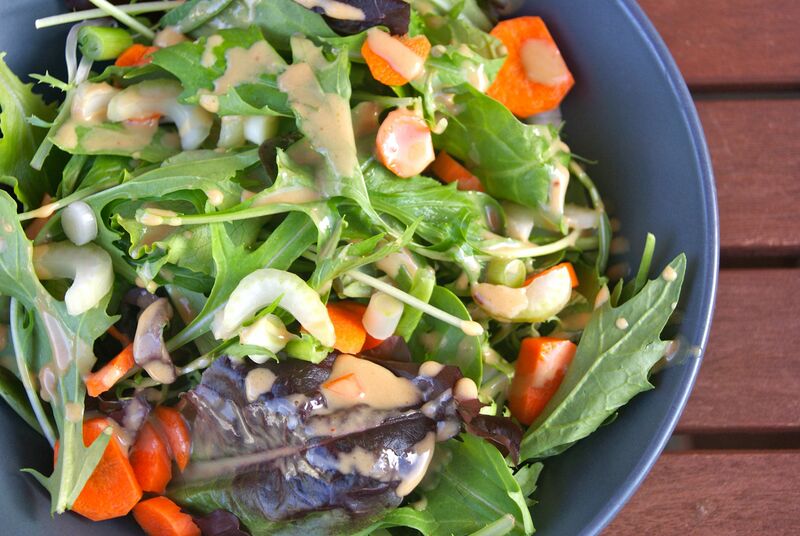 This spicy peanut vinaigrette will give your salad greens an extra kick and you might find yourself coming back for seconds and thirds on salad, which is never a bad thing! We have always enjoyed the Trader Joe’s Spicy Peanut Dressing and this dressing is very similar in taste, if not better. Sprinkle on some vegan parmesan, made with nutritional yeast and ground walnuts, and you have turned your salad into a complete meal. This dressing would also go well with a chopped cabbage salad and brown rice. Omit the red pepper flakes if serving to young children or those who cannot tolerate spicy foods. Combine all the ingredients together in a blender and blend until fully combined. Keeps well in the refrigerator. To serve, toss together with fresh salad greens, chopped carrots, sliced celery and chopped green onions.